Can A 65 Year Old Man Or Women Regain And Build Muscle Mass? I am 65 and had lost a lot of my muscle mass. I researched extensively, and was extremely happy to learn that one can regain muscle mass even after 65. Read on and learn how to do it? For the elderly, less muscle mass means not only a loss of strength, but also increase in the chances of injuries from falling. It’s a sad fact that muscles shrink as adults age. But new studies are starting to unravel how this happens, and what to do about it. Read on to know the truth! So, the pertinent question is: “Is it true that the muscle mass we lose, say, at 60+ years age cannot be regained? Can You Regain Muscle Mass After Age 60+? Let me put the good news straight at the outset: You can regain and rebuild the aging muscles, even if you are 60+ older. Some new research studies have shown that weight training may help older people to retain, and even recover muscle mass. (i) The older men and women developed muscles, which were as large and strong as those of the average 40-year-olds. (ii) The process of bulking up works differently in older people than in the young. (i) The skeletal muscles comprise of various types of fibers. He says two things happen to these fibers after you reach middle age. Some of the muscle fibers die, particularly if you have not been exercising your muscles much. (ii) Sedentary adults can lose 30 to 40 percent of the total number of fibers in their muscles by the time they are 80. Rest of the fibers remain alive but shrink and atrophy as you age. 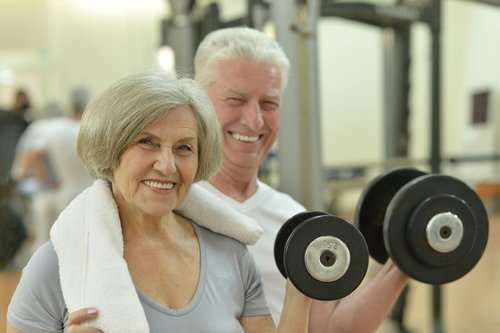 (iii) Seniors can increase the size of their atrophied muscle fibers with exercise. However, exercise for some physiological reasons cannot add to the number of muscle fibers. Tip: The older folks for all practical purpose don’t need to worry because they can make their older muscles larger and stronger if they work them. (iv) The key to gain muscles in old age is regular and progressive weight training. If you don’t go to a gym, consider joining one, and then work on tiring yourself. (v) In order to kick the biochemical processes that lead to larger, stronger muscle fibers, you should push your muscles until they are exhausted. Dr Bamman carried out a study, in which the participating volunteers used weights calibrated so that the lifters could just perform a set of 8 to 12 repetitions before their arms or legs grew leaden and they had to rest. They repeated each set 2-3 times and visited the gym 3 times a week. Tip: If you are new to weight training, ask for an orientation at your gym or talk to an athletic trainer who usually works with older clients. In another study, detailed in The American Journal of Clinical Nutrition, it has been shown that the blood flow and supply rate of nutrients & hormones is lower in the older people, which is a prime cause why muscle wasting occurs in old age. Exercise plays an important role of increasing blood flow to the legs and other body parts of older people to a level identical to the younger group. This increase in blood flow helps in controlling the muscle loss in old age. Are you a senior person? What exercises do you do? Please share your experience with us under the comments section below. I used to go to a gym in my early 20’s. Kids and life took over for the next 30 odd years and I decided to return. Been there 2 years now, lost 30kg’s, reduced my blood pressure and my resting heart rate has dropped. I now have biceps that you can actually see…never had them before! So you can build muscle later on in life. Talk about invigorating! I feel fantastic. I sleep better. I now watch what I eat. I’ve even cut out the cheat meal as I don’t miss the rubbish I used to eat. Do it. Join a gym and surprise the hell out of your mates! Sit back and listen to all of their excuses of why they don’t/can’t/won’t exercise! Machines, kettle bells, dumb bells, I use them all. I go to a couple of spin classes a week…that kills me! Do it for your family if not for yourself. That’s the right spirit. Exercising is as much important in old age as is in young age..
William: Thanks for sharing your experience. I have this firm belief that exercises/workouts are as much important in your old age as when you were young. It’s a proven fact. They increase your confidence and make you capable of living an independent life without depending on others. This is a great article. It points out the importance of muscle in aging people. I think it’s key that people begin and continue routines that lead to muscle adaptation as they continue to age. As a 40 year old man, I believe in workout plans that combine strength, flexibility, and short cardiovascular works outs such as sprinting to keep healthy. My name is Keith,I am 70 years old ,5 ft. 10 inches tall and weigh 240 Lbs.. I do 5 sets of 85% my max one rep lift . I now can lift weights like when I was 40 . I do leg presses ,arm curls ,flies, chest press machines and rowing machine etc.. My leg press – 415 lbs. flies -210 Lbs. chess press 275 Lbs -goal 315 Lbs. arm curl , using both arms, total 130 Lbs . Lat pull 200 Lbs. My arms measure 18 inches when flexed . I live in Rochester New York ,and work out at Golds Gym 3 days a week. I watch what I eat and take supplements of vitamins and minerals . I would be glade to show anybody anytime that age is just a number . I also still work full time. Thank you! Buy a pair of dumbbells. You can work on your biceps, triceps & shoulders at home, using dumbbells. P.S. my resting heart rate is 56- 58 range . Thank you , Fitness buff . It took me 3years to get to this level . I did a lot of reading and tailored my workout to my own needs . The secret is tokeep seeing see progress , stay with it and get lots of rest. (More than two days between workouts when you first start out) ( DO NOT QUIT !) I work out with 22 to 26 year old men . They think I am in my 50’s , I do not tell them differently . This inspires me to keep going ;anybody can do this , just forget your age . I can not begin to tell you how achieving theses levels makes me feel. You are giving people the right advise; I am living proof ! Feel free to contact me if you have any questions . Great article, and great replies. I’m 69, and I felt certain that I wouldn’t make much progress, but I started at the gym at the behest of my son who wanted me to keep healthy. It was the best move I’ve made in years. Although I’ve kept fit and run most of my life, I’ve never concentrated on building muscle, especially on my upper body. My legs have always been well conditioned. I have to laugh! At the age of 69 I definitely have a stronger upper body than I ever have before in my life. I wouldn’t have believed this was possible. If you have any doubts about it, forget them. Just go to the gym and work out. I go every other day, and I walk every other day. I’ve always slept reasonably well, but now sleep is better than ever. One caution I would make is that you should listen to your body very carefully. If there is any sign of an injury, just stop that exercise immediately and move onto another body part. Next time you do that exercise, reduce a little weight, and be very careful. I don’t mean to obsess over this, but I think it’s well worth avoiding injury because that is something that an older body takes longer to deal with. As a final point, I do believe that this kind of good exercise stimulates testosterone production, with the resulting mood and energy improvement. Again, I think this is a very good article, and the comments are equally good. Thanks Don for sharing your personal experience. My advice to all elderly persons: Don’t let the old age keep you from starting an exercise program. Exercise can make a real difference not only in how you feel physically, but also mentally and emotionally. Peter Nicoll, at 75 yrs old , I’m still striving to put on more muscle. I mean size. I am in competition ( body building) and just came second in my category in the Worlds .I compete against 50 yr olds. I’m 5 ‘ 7 and 154 lbs on stage and 163 during off season. The ratio is 80% nutrition and 20% at the gym. What goes in your mouth is a result of what the body will look like. Listen always to your body, lift lighter weights concentrating on technique or form, always resisting the weight,as in curls. Come down slowly and up slowly till fatigue, or drop down sets are excellent. Starting at a higher weight of your choice and coming down in weight, about 10 sec rest in between.The burn is great, it will go , results are excellent. Weights are better for our bone density. Cardio at the end of the session, as it will fatigue you more quickly doing it before. Not much cardio , maybe 10 minutes.Always stretch , before and after . You’ll feel so much better staying active. Try to get a trainer at the gym at least once , to learn the technique and make you a program. Muscles need a change of program every 2-3 months. I hope I have helped. I have Atrial Fibrillation, torn tendons in my shoulders and bone on bone in my right hip. LISTEN TO YOUR BODY, not to some over enthusiastic doctor telling you to stop or he may operate and who knows the result after that. I’ve built my muscle up around tendons in shoulders and now lift much heavier weights than before. Leave your ego at the door, lift properly, not to impress. Don’t become a legend in your own mind. Peter Nicoll My Hip has bad arthritis, and gives me grief, but I feel like yo, what if they don’t get the operation right. Do you take any medication for joint pain,(bone on bone). I lift at the gym and have noticed no more pain than if I don’t lift. I will be 70 in may 2018. And good on you, maybe you can share some more of your knowledge, your diet etc. My height is 172 CM (feet 8 inches), and I weigh 77KG (170lb) can’t get rid of the belly fat, love handles. I’m 66 years old, 6-2, and weigh 266. No one thinks I weigh over 230. Last year I started with a simple weight machine in a campground. I bought a 25 pound dumbbell and use it to muscle failure, along with pushups, situps and a variety of leg exercises. I’ve found you can make dramatic changes with simple tools. Since beginning, I’ve lost from 298 to my current 266. The wife and her kids are always telling me how different I look and don’t look my age anymore. I am glad to know that you find my site useful. Continue doing workout and you will feel active and young. It’s important to exercise in old age to live an independent healthy life. I am a 65 year old female crossfit athlete. I am gaining muscle. Deadlufted 70 pounds, back squat and bench 55 pounds, in just 4 months. Never lifted before in ny life, but didnt like my BMI of 35 percent at 135#. Decided i had to do something about it…and its fun! Yes, it’s a real fun! Keep it up and share your results here. I am 67 (almost 68). I do not use weightlifting because of some joint problems: however, I practice self-resistance exercises with a stick that can be also very effective to keep muscles and gain strength. Factually, you can exercises without any equipment, having only a stick in your hand. GEOFFREY LEE: That’s really great.Keep it up! I’m 69. I lost 61 lbs. in 5 months. I was dead nuts weak. I weigh 186. I leg press 630 for 3. Hack squat 540. Bent over rows 225 for 3. Seated rows 200 for 3 (max machine). Leg extension and leg curls max the machines for 8 reps. Standing calf raises 540 for 8. I can go on. Don’t anyone tell me I’m done at 69. By the way, I can burn the track at 60 and 100 meters. I AM NOT DONE! I am a 63 year old asian doctor, used to swim, sculling champ, horse-riding, hiking, ju-jitsu etcetera as a youngster and into twenties but zilch later on. I took early retirement a decade ago and started farming as a paying hobby, just the physical work and some horse-riding and mountain hiking has made me younger, fitter and stronger – giving up smoking also helped. Thanks for sharing your experience with us. Keep it up.. I just never stopped playing touch rugby with the players before training. I lift weights 3 times pw now instead of 5 times and “listen” to my body better. However I nevr look at training programmes for seniors or over 50 etc. I incorporate the latest and newest (as well as the oldest) trends and regimes for young and fit athletes. That way I don’t adopt the “older” mindset. Thanks for sharing your feed back. I have never tried BFR training, so can not comment on that.. Yes, buddy keep it up! You are on the right track!! I am 66. I run 3-4 times a week, approximately 3 miles per run, do push ups and sit ups every day, and do 2 sets of lifting only 12 lbs with each arm every day. I also play paddleball 1-2 times/wk. Paddleball is like one wall handball but we use paddles. It’s quite popular in NY, where I live. I’ve been running for over 40 years. I weigh 138-140 lbs, have a resting heart rate of 40-45 bpm’s. Have never had pain in my knees. I believe running helps prevent knee problems as it builds bone and joint strength as well as strengthening the ligaments, tendons, and muscles supporting the knee. Thanks for this post! I’m 66 years old. I was told I would die over 15 years ago by multiple doctors. I had seven operations for cancer and two courses of chemotherapy. I had two feet amputated. Fortunately for me they took the two feet off my colon and not off my legs. Seriously, I’m slower in the body and brain than I used to be. I walk four miles a day and lift weights. I weigh 220 pounds and would like to get down to 170 pounds. I feel stronger than I did a year ago. I retired four years ago and am trying to find that magic formula to lose 40-50 pounds. I just seem to stay at 220 pounds. I’ve put myself off sugar, but I think I need to do some other things as well.